Looking at these cards, I'm kind of struck by how apt a representation this spider image is for all that the eight of pentacles usually stands for. Think about how weak, how thin, how delicate a single strand of spider silk seems. Almost laughable, that anything substantial could be made out of that. And yet, undeterred the spider weaves and weaves its way up, creates something it can live on and off of, creates a complicates web, a network of shimmering lines. A method in madness - it connects to branches, to leave, to those glowing green bulbs...it makes something out of seeming nothing for itself, a little niche just right for it. Patience, determination, hard work. How many times does someone, something, casually tear down a spider's web? And out again the spider crawls, afterwards, and starts to weave again and again. And weaving from what onto where? 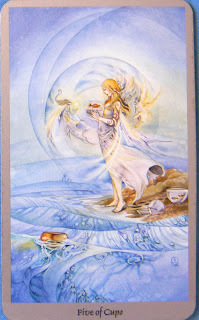 The girl in the five of cups, surrounded by bowls, some spilled, some still full of fish? What does she need to hold onto, focus on, and what is best left spilled, abandoned, put back in the sea? You lose things all the time. Some losses feel unbearable. Some losses you need to fly free. And yet, in either case, it is so easy, so tempting to focus on the loss, to count so carefully what you still have, and what is no longer yours. 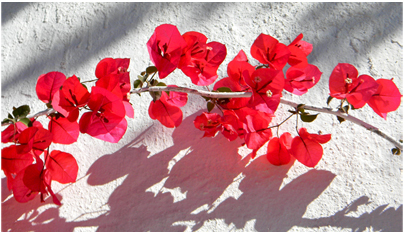 It is easy to think ahead, already imaging when you will lose the next bit, and how. Melancholy, if you let it be, that. 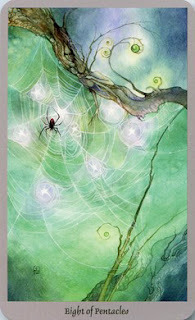 The spider doesn't dwell on all the webs its weaved before, the ones that were destroyed, ripped apart, dissolved. It focuses on the one it is creating now, the one that will tie it into the future, the forward tense. Create and create. Hard work, patience. Letting yourself get lost in the motions of the work as a sort of mediation, an acceptance of all the things you must let go of, cannot change. Look around, at nature. Look at how, despite everything, so many things stubbornly weave, crawl their way up.